For many years baseball cards have been very important to the game of baseball. Cards seem to document the game and bring it to a more personal level for fans. This obviously starts with kids collecting baseball cards. It makes each players face more familiar and seem closer to fans and especially young fans. The internet really hurts baseball cards in this way. It makes players familiar without the benefit of cards or even newspapers. Baseball certainly doesn’t need cards to survive, especially now, but I think it is a key part of the lure of the game. Growing up in a city without a major baseball team I couldn’t make it to many games and cards drew me closer to it without even being at the stadium. A couple of trips to the stadium in a year only added to the excitement. What does all of this mean? It means baseball cards are very important to baseball as a whole and important to each individual club. My team is the Kansas City Royals so now I present the 5 most important baseball cards in Royals history. The 1975 Topps design is one of the most colorful they have ever done. Brett’s rookie card in this set is the iconic image of the set that also included Robin Yount’s rookie. You could also say Brett’s card is one of the most iconic cards in baseball card history. this simple pose of Brett in his famous left-handed stance is burned into the brains of baseball card collectors all over the world. Why is it important? This one is pretty easy. 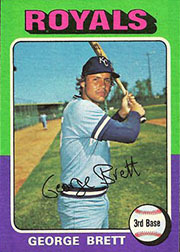 Brett is almost unquestionably the best player in Royals history and a first ballot Hall of Famer. 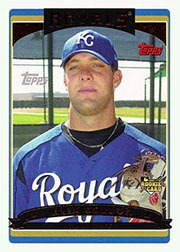 You could argue that even after about 15 years off of the field he is still the face of the Royals. I could list all of Brett’s achievements but if you are reading this you are already well aware of them. First let me breifly explain traded sets. Card manufacturers, mainly Topps, put out a couple of different releases of cards for each year. Topps is traditionally separated into series 1, series 2 and a traded or update set. The traded set is a vehicle to put out cards of players who weren’t originally intended to be in that particular set. There can be 3 reasons for this; the player is a rookie, the player was traded to a different team or the player’s card simply didn’t make either one of the first two series. So a player can appear in Series 1 and the traded set in the same years, this is fairly common. The card in question is a rookie card. 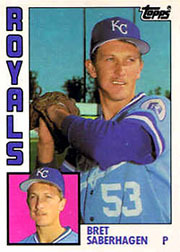 Bret Saberhagen did pitch in 1984 and in fact had 10 wins with a 3.48 ERA. He was included in the traded set and is still one of the most sought after cards in that series. Why is it important? The Royals have won one championship, 1985. Saberhagen was an essential part of the 1985 season posting 20 wins, a 2.87 ERA, AL Cy Young Award winner and most importantly was named World Series MVP. This one is tricky. It’s importance is mostly due to the circumstances surrounding it as opposed the player actually on the card. To call this card a short print is an understatement. This was once one of the most sought after cards in history. There are two versions of the Series 1 card. A regular version and one with the picture actually cut out of the middle of it! They were found in packs this way. A brief explanation: Topps was not supposed to put the card out until Gordon had logged his first major league game. They put it in the set and claimed it to be a mistake. The cards that weren’t distributed yet were “cut out.” The card, in 2006 sold for as much as $7500, a shocking number for a single card. It can now be obtained much cheaper as Gordon’s star has unfortunately continued to decline over the past few years. Why is it important? The value it sold for alone is one reason. As a Royals fan, this represented, at the time, the climb back into contention for a club that had been horrible for years. Gordon suffered constant comparisons to George Brett and the whole franchise seemed to ride on the young shoulders of the “sure thing.” Sadly it still hasn’t worked out. Gordon enters 2011 as a player barely good enough to stay in the big leagues, his potential may be the reason he is still with the Royals. He has moved to the outfield from third base and will have to fight for a starting job in spring training this year. Worst case: Gordon doesn’t ever pan out, The 2006 Topps card will always remain an important part of baseball history. This card is of a young star soon to make an impact on both the MLB and The NFL. Jackson was a rare two sport star. He played for both the Kansas City Royals and Oakland Raiders. The 1986 Topps set is important for the Royals because it largely depicts the team that brought Kansas City their only World Series Championship. This card of Jackson from the next year’s set did not represent that team, it represented the next step for the Kansas City Royals. Jackson did have a traded card in the 1986 Topps set that serves as his proper rookie card. This card sums up the excitement of Jackson, an action shot of him patrolling the outfield while his 1986 card was a simple mugshot picture. 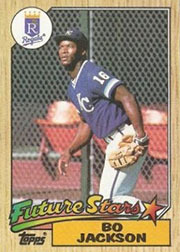 “Future Stars” scrolled across the bottom of the card represents exactly what the Royals needed, their next star player. Why is it important? Bo Jackson represented excitement, whether it was a long touchdown run or a long home run flying out of Royals Stadium. Jackson could pound the ball and make great plays in the field, could steal bases and gun down runners trying to tag on a sacrifice fly. He was a bright personality that brought young fans to the game including myself. Bo Jackson was the first player to captivate me as a young fan of not even 10. I can still remember the excitement of pulling his 1990 Donruss Diamond Kings card out of a pack in Savannah, MO. (Current book value $.25) Jackson was simply the man at that time. Topps has put a second base set card of players that win major awards in recent years(Cy Yound, MVP, Rookie of the Year(I think)) This is a great way to honor the recipient of the awards. 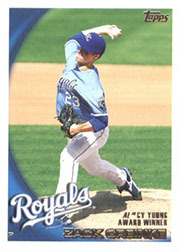 Greinke won the Cy Young award for the AL in 2009 and got this card to reflect the prize. These cards aren’t short prints or even look much different than the base set cards, they also have no more value that the base set cards. As a side note, this card has a much better picture than his 2010 base card. Why is it important? This is really the only curious choice of my 5 cards. I will sum it up by saying the Royals really needed him to win this award. They needed something to hide how bad they were. It also helped sell merchandise and sell tickets greatly. It was a close race simply because Greinke didn’t have the normal amount of wins usually associated with the award. It wasn’t that he was pitching bad, it was that the Royals hitters seemed to take the day off when he was on the mound. Greinke had a eye-popping 2.16 ERA during the season while winning only 16 games. If CC Sabathia would have had a 2.16 ERA that season with the Yankees he may have won a number of games that would have been in the upper 20s. Greinke is gone, and that is a good thing now I believe, but at the time it was one of the most important achievements in Royals history because they sure weren’t getting any awards associated with winning at the time. The card is important because of the effect of the achievement the card itself would be listed as a common in nearly any price guide.